A five-wicket haul from Adam Barton couldn’t prevent Hastings Priory Cricket Club’s first team falling to a derby defeat. Priory lost by 64 runs at home to third-placed Eastbourne in the Sussex League Premier Division yesterday (Saturday), despite left-arm pace bowler Barton claiming 5-57 from 16 overs. Eastbourne were all out for 261 in 52 overs after winning the toss and choosing to bat at a sunny but windy Horntye Park. Barton, returning from injury earlier than anticipated, landed an early blow by having former Kent professional James Hockley caught by Jed O’Brien for eight with the score 13. Josh Beeslee (14-2-75-3) caught Daniel Arms off his own bowling for 26 to leave Eastbourne 44-2, but a third wicket partnership of 102 laid the foundations for the visitors to post an ultimately match-winning total. That stand was finally broken when Beeslee had Alastair Orr stumped by Joe Billings when one short of his fifty. Beeslee claimed his third victim 15 runs later, bowling Eastbourne captain Jacob Smith for 62 - the highest score of the match. Barton returned to bowl Ben Twine for 14 and ex-Bexhill player Malcolm Johnson a run later, leaving Eastbourne 186-6. 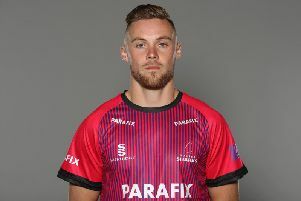 But a seventh wicket partnership of 57 between Jordan Turner and Joe Pocklington took Eastbourne well past the maximum batting points mark of 225. O’Brien (14-1-72-2) had Pocklington caught by Greg Devlin for 25 and three runs later Barton bowled Turner, who made a game-changing hundred in May’s reverse fixture, for 30. O’Brien trapped Jordy Watts leg before for four to make it 260-9 and Barton wrapped the innings up a run later, pinning last man Henry Crocombe leg before for a fourth-ball duck to complete his first Priory five-for since 2015. Priory were all out for 197 in reply with eight balls of the 58 overs remaining. Seven batsmen made double figure scores, but only two got to 30 and none to 50. Tom Gillespie and Joe Billings got the innings off to a decent start with an opening partnership of 68 only to fall within five runs of each other. Gillespie was firstly bowled by Pocklington for 29 and Billings was then caught off the same bowler for 37. Ryan Hoadley was caught and bowled by Smith (15.4-1-59-2) for 15 with the score 107 and John Morgan, batting up the order at number five, was leg before to Hockley (8-0-24-2) for eight to make it 121-4. Devlin was caught off Hockley for 15 with Priory on 153 and Eastbourne claimed the key wicket of Jake Woolley, bowled by Pocklington for 48, 14 runs later. Woolley has now scored 284 runs in his last five league innings and is nearing 450 league runs for the season. Adam Pye was caught off Pocklington for a second ball duck to leave Priory 167-7 and Harry Scowen became Pocklington’s fifth victim when he was caught for 15 with the score 180. Pocklington bagged his sixth wicket with a return catch to dismiss Beeslee for a single to make it 189-9 and in-form Eastbourne, who are enjoying an excellent season having only been promoted last summer, sealed another victory when Smith trapped O’Brien leg before for 17. Sussex Premier League standings (all played 13 matches): 1 Roffey 297pts, 2 Brighton & Hove 283, 3 Eastbourne 282, 4 Horsham 254, 5 Preston Nomads 251, 6 East Grinstead 242, 7 Middleton 196, 8 Cuckfield 189, 9 HASTINGS PRIORY 139, 10 Ifield 119.